So, day two of our trip to New Orleans began with breakfast at Satsuma Cafe and a mid afternoon snack of, well, bugs. It ended with more walking through the French Quarter, a search for a restaurant with both oyster po'boys and shrimp and grits that didn't involve a whole lot more walking, checking out a famous bar and a late night coffee. Amazingly, the bug buffet did not fill Haley and Ayla up as much as one would think, so after another stroll through the French Market, we began to think about dinner. I really wanted an oyster po'boy and the girls had their hearts set on shrimp and grits. We wanted to check out another restaurant suggestion Scott had made, Casamentos, but it was just too far away. We were quickly running out of steam and needed a place we could get to without much effort. Luckily, The Original French Market Restaurant and Bar was just steps away and, miracle of miracles, it also met our menu requirements. So, off we went. It turns out, The Original French Market Restaurant and Bar is not a fly-by-night establishment. Their website says the restaurant opened its doors in 1803, twelve years before Andrew Jackson won the Battle of New Orleans. Unlike Satsuma, which was full of locals, The Original French market Restaurant and Bar, was stuffed with tourists. Even though the place was busy, we were quickly seated. After our drink orders were taken, we chose a shrimp and crab appetizer with Creole cream cheese, artichokes, and spinach topped with provolone cheese and served with crusty French bread, Since we knew what we wanted before we got to the restaurant, ordering was easy. Here is my oyster po'boy. It was very good. And here are the shrimp and grits, which both girls seemed to enjoy. I made that deduction based on the fact that there were none left at the conclusion of the meal. We left The Original French Market Restaurant and Bar full and satisfied and ready for more exploring. We wandered around the French Quarter some more and then decided to check out the two hundred year old Jean Lafitte's Old Absinthe House. The bar has a storied past. The pirate Jean Lafitte and Andrew Jackson are said to have met in an upstairs room as they planned out the Battle of New Orleans. Other luminaries, from PT Barnum, Mark Twain and Robert E. Lee to Frank Sinatra, Liza Minelli and Franklin Roosevelt, have enjoyed the hospitality of the Old Absinthe House. We went in thinking we would try out one of the mysterious drinks from the old watering hole. Because of its hallucinogenic properties, true absinthe, made from wormwood, is no longer legal in the US, so the Old Absinthe House now serves substitutes, most often Herbsaint, which is produced in New Orleans and features a picture of the Old Absinthe House on its label. The flavor of Absinthe and, I assume, the substitutes, is said be similar to licorice. Since none of us like licorice, our thinking was we would just get one drink and taste it, just for the experience. However, after we studied the menu, we concluded the prices were too much to warrant wasting the money for just a taste of something that was probably going to be strong and licoricey. But, who knows? I did have that delicious Herbsaint-smoked gouda mornay sauce with my oyster crostini at Commander's Palace and it was divine, so I might have liked it more than I anticipated. Then again, Chef Tory McPhail can probably make roofing shingles and caulk taste good. Since we didn't have any refreshments at the venerable Old Absinthe House, we moseyed on down to the Envie Espresso Bar for late night coffees. After all, we were in New Orleans! Who sleeps there? After a great big slug of caffeine, we were ready to head back to our room and get rested up for our last morning in the Crescent City. 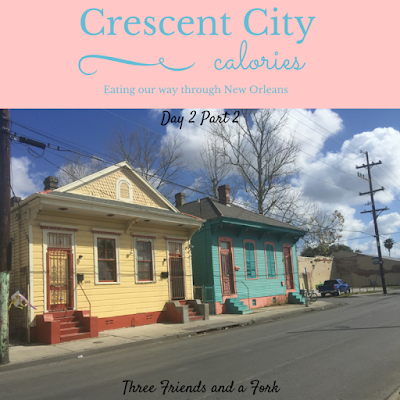 Three Friends and a Fork gives 2 Yums UP to The Original French Market Restaurant and Bar. Though it is pretty touristy, the food was good. It was not super original, especially by New Orleans' standards, but tasty nonetheless.